First Aid support is provided primarily by two organisations; BAE Systems First Aid Corps and St John Ambulance. 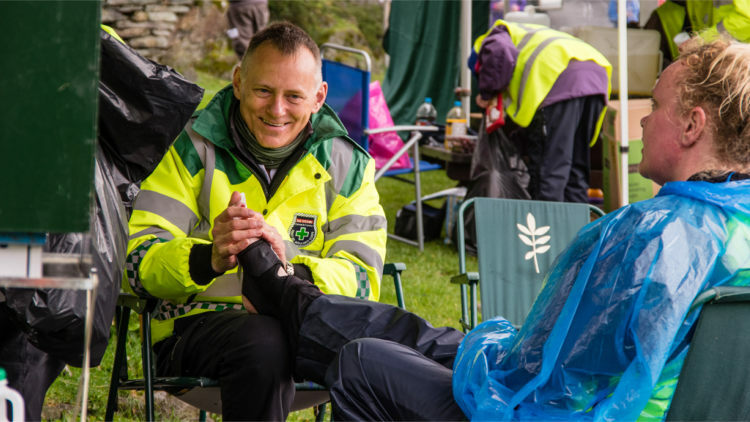 These volunteers ensure that, in the event of problems during the walk, they are able to provide the most up to date treatments that prevent any potential injuries from becoming worse. You will generally find teams of First Aiders at each checkpoint but they also pop up along the route at suitable locations that have been identified over the past few years as points where walkers begin to find the distance a major challenge. These teams are there to ensure you gain the best experience from the walk and provide their services free of charge. Whilst you may be tired and frustrated by the effort you have put in and difficulties experienced throughout the day, please treat these volunteers with respect. An obvious problem that most walkers are familiar with and have their own treatment for. "A blister needs no treatment if unbroken. However, if it breaks or is likely to be damaged, cover the injured area with a dry, non-adhesive dressing that extends beyond the edges of the blister. Leave in place until the blister subsides, this helps to prevent infection. Never break a blister or cover with any creams or lotions. Seek help from a First Aider or your Doctor." Hardened feet are less prone to blisters: regular walking hardens the feet and thickens the layer of dead skin on your soles. Some people recommend regular applications of surgical spirit in the days leading up to the event. There is a deluxe type of plaster called Compeed available from chemists, which you apply to vulnerable areas of your soles before the walk. This can reduce the chances of suffering blisters on the heel, ball of the foot and the area just behind the toes. Ensure that nothing you wear or carry rubs against your body. On a short walk you may hardly notice but continuous rubbing on a K2B can lead to major sores. In particular, pack and adjust your pack so that pressure on your back is not concentrated at a single point. Don’t keep anything in your pockets. Too tight clothes, especially underwear, can also give problems. Walking 40 miles (or 23 miles) uses a large number of calories. Estimates vary but for a person of average weight, brisk walking on easy terrain uses about 300 kcal per hour, with over double that for hill climbing. A chocolate bar might contain 150 kcal and this has to provide for the basic functioning and warmth of the body as well as energy directly used for walking. The message is that you have to eat a lot to replenish the energy, which you are expending. Eat and drink plenty and often, particularly energy-rich foods such as cake, bananas, dried fruit and isotonic drinks supplied by your support crew. Take the free soft drinks and water provided at each checkpoint. Eat the free burgers and sandwiches served by volunteers at Machells Coppice (Coniston Water), even if your appetite seems poor. Don’t be tempted to rush through without eating just to save a few minutes. This is mainly a potential problem for runners in hot weather, although even in average May temperatures, you will lose much water through sweating. If this is not replaced regularly you may feel unexpectedly lacking in energy. You should drink at every opportunity even if you do not feel thirsty, both at checkpoints and by keeping your water bottle topped up – most especially on a hot day. The body loses salts at the same time as the water, increasing the chances of cramp. This problem can be avoided by eating salty food at checkpoints and taking advantage of the free lunch at Machells Coppice. However, if cramp strikes, a salt tablet or a little salt dissolved in water can give almost instant release. After the 2003 London Marathon, a runner had to be taken off his train home as a casualty. He had drunk plenty of fluids, but eaten insufficiently, leaving his body salt level so low that his brain functioning was affected. Full emergency hospital treatment was necessary to stabilise his condition: a situation, which need not have occurred. Everyone feels tired at some point on the K2B or C2B. Walkers commonly experience a second wind after a period of tiredness and suddenly feel much better and able to continue. A rest at a checkpoint can be very refreshing. Physical exhaustion and hunger combined with wet and windy weather are just the conditions that can lead to hypothermia. There have been several K2Bs where a fine morning has been followed by cold rain in the afternoon. Carrying adequate clothing is crucial, in particular wind and rain protection and clothing which retains its insulating properties when wet, such as wool or thermal fabrics. If you feel even slightly cold, particularly later on in the walk, put on extra warm clothing to reduce heat loss. When you stop at later checkpoints it is a good idea to put on an extra layer until you are walking again, otherwise you may start to shiver. At the end of the walk as you enjoy your free drinks at the Sports Club there is the probability of getting cold again unless one of those perfect balmy warm May afternoons has developed, and an extra layer will be required. Walk at a pace that comes naturally. If you go either above or below your natural pace you’ll tire far more rapidly, both physically and mentally. While it’s good to journey with other walkers, you should ensure that their pace is close to yours. It’s easy to set off too quickly or jog too much near the start and suffer later. On the other hand, there is a strong mental desire to keep up with the pack near the start and making good progress early on does give a psychological boost. If you reach a checkpoint feeling you want to finish, rest for a while before deciding to drop out. Often a rest, some food and a chat with the checkpoint marshals or your support crew, will help you over a low point of the walk. Some walkers arrive at checkpoints saying, “I’m finished,” but revitalise their energy and spirit and go on to complete. If after a rest you feel that you really can’t go on, then it’s no disgrace to pull out – there’s always next year. We have volunteers from the Coniston and Furness Mountain Rescue Teams patrolling the entire route south of Coniston, who are able to help walkers who have had enough.